"We saw massive destruction," LeSueur says. "But within two days, people were in the streets with shovels. Seeing the response has been just awe-inspiring." But nearly a week after the storm, sand and rubble are still being cleared. As aid begins to trickle in, it's becoming clear that other impacts of the catastrophe, which LeSueur calls "the worst humanitarian crisis in Mozambique's history," will be much harder to resolve. An unknown number of people are still stuck on rooftops, in trees or on small islands of land that stayed above the floodline. 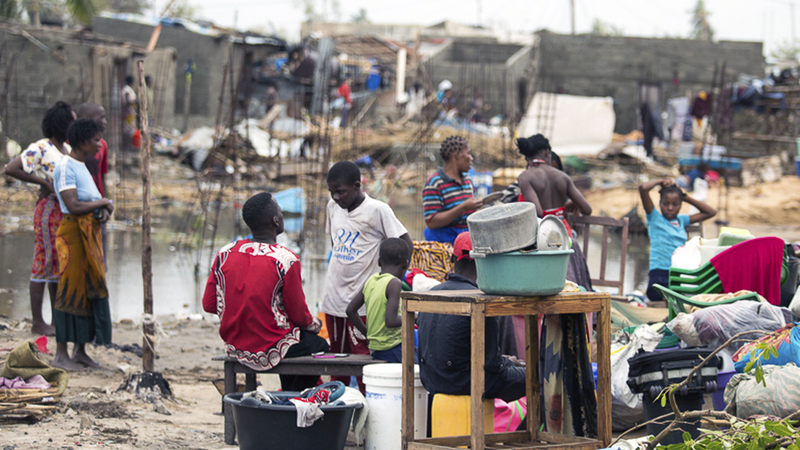 The IFRC estimates that at least 400,000 people in Mozambique were made homeless by the storm. The death toll could rise to more than one thousand as search-and-rescue efforts coordinated by the government and the United Nations continue, Mozambique's President Filipe Nyusi told the Associated Press on Monday. Hundreds of deaths were also reported in neighboring Malawi and Zimbabwe, where the storm triggered flash floods, high winds, and mudslides. Altogether, up to 2.6 million people were affected by the storm, according to the U.N., which on Tuesday said it will need $40.8 million in emergency relief funding. As of Tuesday evening in Beira, electricity and water pipelines were still down. The main hospital is open but has sustained severe damage, and a number of smaller clinics lost their roofs or were otherwise taken out of commission. Some roads are open but not the main one leading out of town to the capital, Maputo, meaning that the only way for aid to reach the city has been by helicopter. According to The New York Times, more than a dozen aid trucks are stuck on roads outside the city. The few emergency aid groups that have managed to reach the site are severely outnumbered by the people they're trying to help: LeSueur has a team of ten, which he hopes to increase to 30 in the next few days. Claudia Aguiar, advocacy manager for Doctors Without Borders (MSF) in Maputo, says her group has managed to bring in seven people so far, in addition to 150 Mozambican staff who had already been based in Beira at an HIV clinic (all are unharmed, she says). For now, many displaced people are taking shelter in schools and churches, and humanitarian groups are focused on delivering food, clean water for drinking, bathing, and cooking and blankets. LeSueur says that aid helicopters have been dropping floating aid parcels into the floodwaters near homes, and using the draft from the choppers' propellers to blow the packages close to those in need, so that the draft and the dropped packages wouldn't further damage fragile buildings. The situation is even more precarious in the vast countryside surrounding Beira, where roads remain inundated and affected towns are still largely unreachable by emergency responders. By the end of this week, MSF plans to complete its assessment of the human toll in order to determine what services are most needed — and where, Aguiar says. "It's a really dire situation," she says. "We need to decide where it's most pressing to for us to intervene. We don't want to duplicate efforts of other relief organizations." Even as the work to save lives continues, other risks loom in the near future. Paul Spiegel, director of the Center for Humanitarian Health at Johns Hopkins Bloomberg School of Public Health, says he expects to see an increase in cases of dysentery and cholera, since clean water, soap, and functioning latrines are scarce. Especially for children under five, diarrhea can quickly turn life-threatening. Rain is still falling; the damp conditions are associated with a higher risk of contracting pneumonia and other respiratory diseases, which can then spread easily in crowded shelters, he says. At the same time, people who suffer from non-communicable diseases like epilepsy and diabetes may lose access to their medication, he says. Gert Verdonck, MSF's emergency coordinator in Beira, said in an emailed statement that providing medical treatment will be a challenge even as medical supplies become available. "It's even difficult to get to the health centers, because the roads are destroyed or because the health centers themselves are destroyed," he said. "I think that's our biggest challenge right now." As more people move into emergency shelters, a key priority for humanitarian workers will be to construct sufficient latrines, supply soap and water chlorination equipment and remind displaced people to wash their hands, a step that's easily overlooked in a crisis but can be crucial to cut off hygiene-related diseases before they begin to spread, LeSueur says. "Really the priority right now is saving lives," LeSueur says. "But we want to make sure displaced people have a blanket over them and roof over their head, and we want to get ahead of the water situation." Once the flood waters recede and search-and-rescue operations end, the storm will likely lead to food shortages for months or years in a region where a high portion of the population are subsistence farmers, says Kieran McConville, a spokesperson for the humanitarian group Concern Worldwide, which has operations in the affected countries. The storm hit just before the annual harvest season, damaging at least 330 square miles of crops, according to the U.N., and killing an unknown number of cows and other livestock. "We're in the hungry season, when food from last year has started to run out and the harvest has not started to come in," McConville says. "So people are not in a good place to cope with something like this." For now, LeSueur says, the top priorities are expanding the reach of first responders and aid workers into rural areas along with opening transportation lines so that aid can get in more easily.